We are trying a few new things here in our home. Mainly, saving money. I have been trying to do this for the last few years. I just really haven’t been doing all of the things together. In my hometown, we used a lot of coupons. I followed the ads religiously and price matched with coupons. I scoured the Internet for numerous sources to print coupons and we really did save quite a bit of cash. In Missouri, we really made an effort to eat more home cooked meals and eat out a lot less. But, we didn’t save as much because we went away from planning our meals and couponing. Now, I have been trying to make things at home, from scratch. Not just food, but other things too. Which is why I made B deodorant. I just need to bring it all together. Then, we can save tons of cash! 1. Put tomatoes, beans and water in a large saucepan. Do not drain the tomatoes or beans. Add parsley, garlic, pepper and thyme. Heat to a boil. Taste it. If it tastes tangy, add 1/8 cup of sugar. Stir, and taste again. If still too tangy, add more sugar. Not more than 1/4 cup total. Taste again before adding salt. Add salt. 2. Once it is boiling, add noodles, cover with lid and turn off burner. Stir a few times until noodles are tender. 3. Serve with cheese sprinkled on top. Now, I added the sugar because it was very tangy and tart. You may not always need to add it. The key to cooking is taste, add a little bit of something and taste. You don’t want to always taste something before you heat it, the flavors aren’t melded together yet. Honestly, I didn’t follow the above recipe completely, everything is in there, but I didn’t measure except the water and noodles. This is partly because I couldn’t find a measuring spoon and mostly because once you add too much to something, it’s hard to get it back. I know my family’s tastes and I cook according. Good luck and happy tasting! 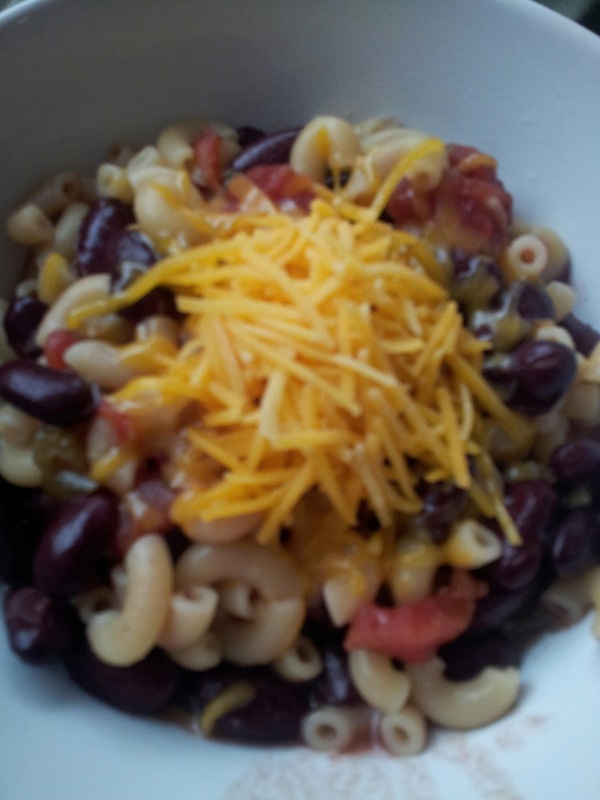 This entry was posted in money saving, pasta, recipe, red kidney beans, vegetarian. Bookmark the permalink.